Representative Serine/Threonine Kinase Substrate Screening Kit Plate 1 using Akt1 Kinase. Akt1 was used to phosphorylate biotinylated substrate peptides. Vertical-axis is DELFIA® count. Rows are noted by letters A-H. Columns are noted by numbers 1-12. 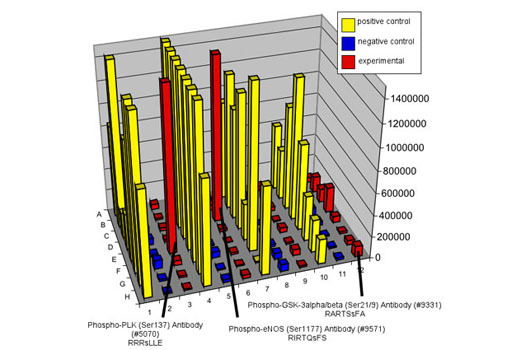 Values in columns 1, 4, 7, and 10 are DELFIA® counts for positive control biotinylated phosphopeptides (shown in yellow). Negative control values (nonphosphopeptides) for the array are found in columns 2, 5, 8, and 11 and shown in blue. Experimental values are found in columns 3, 6, 9, and 12 and shown in red. Positive hits on the array are noted along with partial peptide sequence that served as substrate. Kinase of interest is incubated with biotinylated substrate peptides. Phosphorylated products are captured on streptavidin-coated plates. Cell Signaling Technology antibodies serve as primary detection reagents; DELFIA® Europium (Eu) anti-rabbit or anti-mouse chelates are used as secondary antibodies. Positive hits from Serine/Threonine Kinase Substrate Screening Kit (#7400) can be used in any subsequent peptide based kinase assay. The Serine/Threonine Kinase Substrate Screening Kit provides 87 biotinylated nonphospho-peptides as kinase substrates. Also included are biotinylated phospho and nonphospho-peptides of identical sequence as positive and negative controls respectively. Potential substrate phosphorylation is detected by the corresponding phospho-specific antibodies. The paired phospho-specific antibody and peptide substrate can be used for high throughput peptide based kinase screens (e.g. FP, TRF, AlphaScreen). 10 to 1000+ fold signal-to-noise ratio of phospho- versus nonphospho-peptides measured by DELFIA® assay. In order to expedite the isolation of substrates for novel kinases, Cell Signaling Technology has developed a kinase/substrate development kit. Numerous serine/threonine kinases have become pharmaceutically important, including GSK, Akt and p38. With the cloning of hundreds of uncharacterized serine/threonine kinases, drug discovery researchers are seeking to quickly find substrates for high throughput screening programs. With a total of 87 different peptide/phospho-specific antibody pairs on the array, a very diverse group of substrates is represented. Signal-to-noise ratios have been optimized and range from 10 to over 1000. 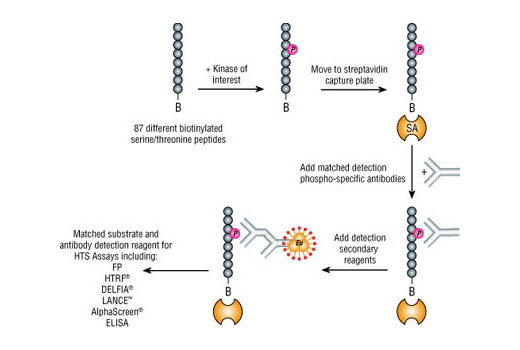 The phospho-specific antibody and peptide substrate pair can be used for subsequent high throughput peptide based kinase screens (e.g., FP, TRF, AlphaScreen).